For almost everyone, mobile technology is a way to get breaking news. 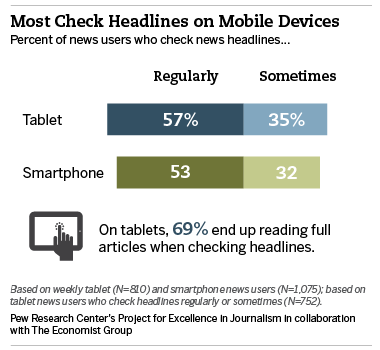 People use both mobile devices (tablets and smartphone) heavily for checking headlines: 57% of tablet news users do so regularly and another 35% sometimes. The pattern is nearly identical on smartphones with 53% regularly checking headlines and 32% doing so sometimes. While headline-checking seems like an obvious activity on mobile devices, a major question that accompanied the devices’ growing popularity was the impact that tablets and smartphones might have on how people in the digital space read and value longer articles. This not only has implications related to the dissemination of knowledge, but also to the financial opportunities for news and information organizations focused more on long-form content than headlines; would people notice the advertising and would they value a news provider? This was a major issue on the first generation of digital devices, the desktop and laptop computer. Most research and usage data found that people did not read stories on computers for very long and they tended to skip over advertising. In our initial survey of the first wave of tablet users a year ago, we found substantial evidence that the earliest adopters of the tablet did use the devices to read long-form articles. This year, we probed deeper into the kinds of in-depth reading people are doing and the extent to which this kind of news consumption also occurs on the smaller-screen smartphone.